Scandal-ridden Wells Fargo isn't opening as many accounts these days. The number of consumer checking accounts opened plunged by 25% in September from the year before, Wells Fargo (WFC) said on Friday. Openings fell 30% just between August and September, when Wells Fargo shocked Americans by saying it fired 5,300 workers for creating unauthorized accounts. It's the first evidence that Wells Fargo is feeling the effects after admitting it opened as many as 2 million fake accounts since 2011. "We're prepared for things to get worse before they get better," said Tim Sloan, who this week replaced controversial CEO John Stumpf. In a conference call with analysts, Sloan acknowledged the criticism of Stumpf, saying senior management "could have -- and should have -- done more." He said Stumpf decided to step down because he "believed his leadership had become a distraction." Wells Fargo said its roster of customers actually rose in September, but visits with bankers declined due to lower referrals, product offerings and marketing activity. The numbers suggest Wells Fargo felt an immediate impact after the September 8 settlement. Scrutiny on the bank has intensified with two Congressional hearings on September 20 and 29, where lawmakers compared Wells Fargo to a "criminal enterprise." Earlier this week, longtime CEO John Stumpf abruptly decided to retire. Related: Stay on top of the markets. Download the CNN MoneyStream app. For the first time, Wells Fargo also revealed that there may have been tens of thousands of small businesses impacted by the scandal. Wells Fargo said a previous review identified 58,000 un-activated small business credit cards. Just over half of those cards were closed prior to the settlement, while another 25,500 are still outstanding. Wells Fargo said it's working to contact those customers to check on the status. Wells Fargo said it's also planning to help customers whose FICO scores may have taken a hit due unauthorized credit card applications. The bank said the impact varies, but was likely "small" and for about one year. In response, Wells Fargo said it's correcting credit bureau inquiries and will work to refund customers who may have suffered from higher borrowing costs as a result. 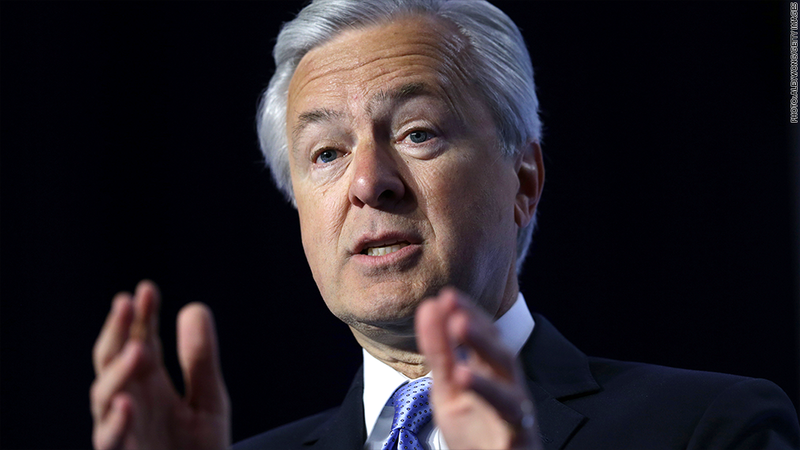 With just one day under his belt as Wells Fargo CEO, Sloan acknowledged the challenges ahead, saying he's "deeply committed to restoring the trust" of customers and investors. "We know that it will take time to and a lot of hard work to earn back our reputation," Sloan said. One way to do that: advertising. Wells Fargo said it has begun to reintroduce marketing and will increase its marketing budget over the coming months. Some analysts believe Wells Fargo could face an even bigger backlash from customers who feel they were cheated. Steve Beck, founder of management consultancy cg42, predicts Wells Fargo will experience "heightened levels of defections" over the next year. Beck pointed to his research that shows Wells Fargo customers had long had a sense they were getting sold products they didn't want or need. The scandal has forced Wells Fargo to make a dramatic reversal of its business strategy by abandoning the sales goals behind its now-infamous cross-selling emphasis. Employees have said unrealistic goals forced them to cheat by opening unauthorized accounts. Sloan said it's been "disturbing to hear claims of retaliation" from Wells Fargo employees who called the ethics line. Nearly a half-dozen Wells Fargo workers told CNNMoney they were fired after flagging illegal sales tactics. Sloan said Wells Fargo is investigating these claims and reinforcing its code of ethics and non-retaliation policies. On a broader level, Sloan said it would be an "understatement" to say Wells Fargo employees have been "put through the wringer" as a result of the scandal -- especially in the retail bank. Asked if Wells Fargo is considering bonuses as a way to say "sorry," Sloan said "all ideas are on the table" to "re-recruit in this environment." Wells Fargo faces a laundry list of class action lawsuits and investigations, including one from the Department of Justice. The bank did not specify how much money it has set aside to pay upcoming legal settlements, however it did say expenses jumped 7% last quarter in part due to higher "litigation accruals." Wells Fargo, which was slapped with a $185 million fine over the fake accounts, said it expects costs to "remain at an elevated level."